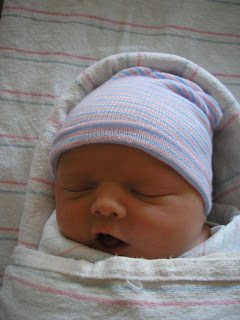 We promised an update with pictures of our new baby boy. He was born Aug. 21st at 7:32 pm (within 24 hrs of Landon Hoefferle), weighed 8 lbs 4 oz. and was 20 inches long. He likes car rides, milk, and long walks on the beach. If you try to tell him he is to young to drive, he will likely cry and resent you for the few minutes that his memory allows. Savannah was a super hero in the hospital room, getting through the hardest part of labor without even one complaint. She was going so well they made her stop pushing because she was progressing faster than the doctor could get there. We are now home and relaxing (haha... yeah...) with our new son. After these first few days Savannah and I have a new respect for all parents everywhere. If you are a parent and we haven't grovelled at your feet, please accept our apologies. Despite all rumors to the contrary, I still haven't had a baby. I have been getting texts from my sisters every half hour to ask, but apparently my womb is comfortable and climate controlled, so Baby Knight is planning to make as late an exit as possible. 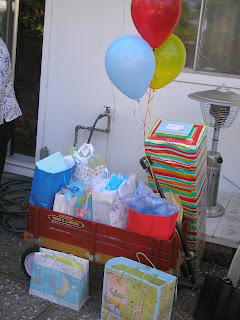 In the meantime, I owe a lot to friends and family who have put on great baby showers for us. 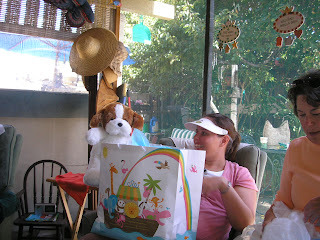 This is the baby shower Colette and Annette threw in Arizona on June 6. In this picture, from left to right are Karen, Tania, Sadie, Katie, Heidi, Gigi holding Amy, and Becky. It was a great party and a good chance to say good bye to friends from Tucson. Thanks for the great gifts, everybody! We miss you! I put in the picture because I looked at it and can't believe how much fatter I've gotten in the last two months. I think Rachel is looking happy because she is about to win the identifying-baby-products-inside-brown-paper-bags game. We have also had a couple of great showers with new friends in California. Betty Jo, Dru, and Meagan put on a baby shower with the relief society sisters on August 1. We have the greatest new ward! Thanks for being so generous. We can't wait to get to know you better! I took home some of the food Betty Jo made and Todd immediately decided that she will be our new best friend. I even caught him flirting with her at church the next day to try to get the recipe. These presents look too pretty to open. This is Dru reading the right answers to one of the games we played while Crystal and I listen. The clothespins around my neck are part of another game we played- no one was allowed to say "Savannah" or "baby." If someone caught you saying either one, you had to give up one of your clothespins to them. I was pretty good at it, except when I slipped I would always catch myself and then someone would catch me. Last Wednesday my water aerobics class surprised me with a shower after class. Thanks to Lulu, Rita, and Candy especially, and to everyone for the great gifts! 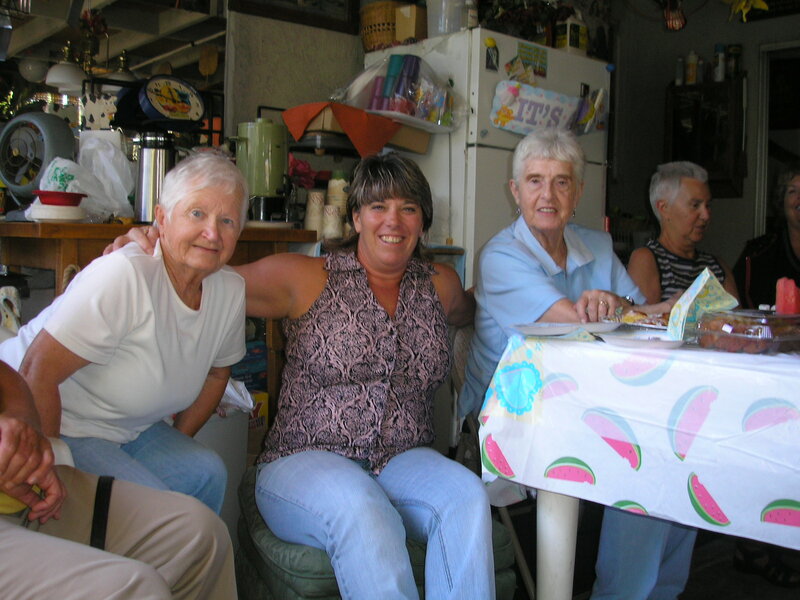 In this photo: Bernice, Kathy (the instructor), Barbara, and Doris. I think that this dog may be Todd's favorite of all the gifts, but that's hard to say because he thinks that all of them are for him. I interrogated him about why his showers have started lasting for so long and learned that he's been playing with bath toys that I put in a basket by the tub. The stuffed dog he immediately named "Rufus" and then carried it around for two days straight, talking to it and trying it out in the baby bouncer and the baby carrier. I'm going to have a hard time convincing him to hand the dog over when the baby is old enough to play with it. It's been hard enough already to persuade him that the stuffed dog doesn't want to share his popsicle. Being the parent of a baby should be easy after this, right? Since the house is already Todd-proofed. . .
My mom said that when she was 9 months pregnant she would catch a glimpse of her reflection in a window and be startled to see that anyone could get so fat. That's about where I am right now. 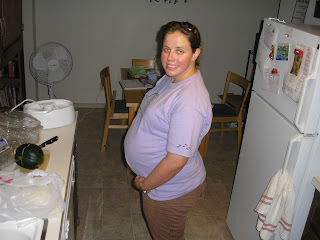 Todd is convinced that I'm going to have a baby any minute, so he needs to document every day as my "last day pregnant." This is my last day pregnant about a week ago. Pretty big, right? Finally, in response to the latest text from Cheyenne, no, the baby hasn't been born yet. We'll post pictures as soon as the big moment arrives. 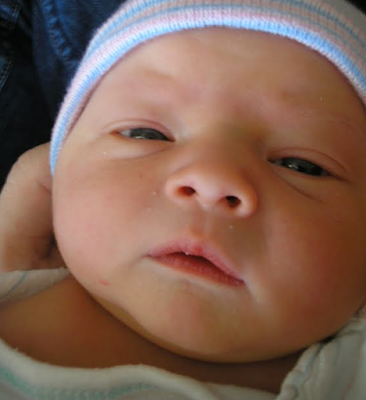 You all can just spend these last few hours sitting on the edges of your seats for pictures of the cutest baby ever born. We'll allow you this extra time to prepare yourselves, only because we think you'll need it. So after hearing Savannah claim she is in labor once a night for the last 2 weeks, I decided that I should rely on the power of the mob. We started gathering people's guesses on when he is going to be born but we aren't able to get everyone for some reason or another. Please tell me when you think our child is going to be born so I know when to start listening to Savannah again. As a point of reference, the due date is Aug. 25th, 2009 and I think he is going to be born this Saturday (the 15th) at 2:00 am. Whoever guesses right just may be able to hold the baby when they see him in person (depending on your hygiene)!!! Then you can tell all your friends on the facebox about it!